Martin Lawrence is one actor and comedian that practically dominated the comedy genre in terms of movie and television back in the 90s and early 2000s. His sheer brilliance on screen was quite uncanny and well executed to the point of even playing an old lady in the blockbuster movie, “Big Mommas House” which was first released in 2000. The movie was so successful that it panned two other movies of the same title all to critical acclaim and reception. Martin sure has had a long and successful career. Read on to discover what really makes him an exceptional talent. When he was eight years old, his parents got divorced. His father(John Lawrence) as a result of this became quite estranged from the family thus causing his mother(Chlora Lawrence) to work several jobs after military service just to support him and his siblings. In his teens, Lawrence lived in Landover, Maryland and was very much fascinated with boxing. He attended a handful of schools including; Eleanor Roosevelt High School (Greenbelt, Maryland), Fairmont Heights High School (Fairmont Heights, Maryland), Thomas G. Pullen School of Creative and Performing Arts (Landover, Maryland); and Friendly High School in Fort Washington, Maryland, where he was a contender for the “Mid-Atlantic Golden Gloves boxing.” He loved the sport so much that he was considering going pro with it, unfortunately, after a broken eye which he sustained from a fight, he had to reconsider and look at other options. After a future in Boxing was looking bleak, Martin had to look for an alternative career path and so he thought of showbiz and Hollywood. He is a naturally funny and charismatic guy and being apt for the trade, he decided to give it a try. This was the decision that prompted him to move to New York where he became affiliated with the legendary “The Improv.“ He later got the chance to be a part of “Star Search.” Though he performed well on the show, he didn’t win the competition. His breakthrough role came when he starred in the Spike Lee movie, “Do The Right Thing.” He soon after featured in other lightweight movies including; “Talkin’ Dirty After Dark,” “House Party” and “Boomerang” also within the same period. From his movies and the fame he was amassing, he was then selected by entertainment mogul, Russell Simmons as the host of HBO’s “Def Comedy Jam.” Still wit HBO, Martin featured in his own highly successful self-titled series “Martin” which ran from 1992 to 1997. In 1994, Martin who hosted “Saturday Night Live,” was banned for life after he went ahead and opened with the monologue (about women’s genitalia and hygiene) that was initially agreed to be scrapped by the producers. He then moved into more mainstream comedy movies with him starring usually alongside equally famous comic actors such as Eddie Murphy, Tim Robbins etc. Most of such movie proved to be money spinners of which one of the biggest to date happens to be the “Big Mommas House” movie series. Many movies came through which were blockbusters. As at 2008, Martin lent his voice to his first animated children’s film, “Open Season” and also acted in his first G-rated film”College Road Trip.” This was a Disney film which he co-starred with Raven Symone. With a successful career in movies, and stand up comedy Martin Lawrence was the real MVP back in the days. His fame was so huge that most comedy projects wanted him on board. With these achievements in the Entertainment industry, coupled with his investments in real estate, Martin no doubt has been living the life. As of recent his net worth is estimated to be well over $110 million. This is a figure most newbies can only dream of but Martin keeps proving that he is no pushover and that he is as talented now as he was back then. 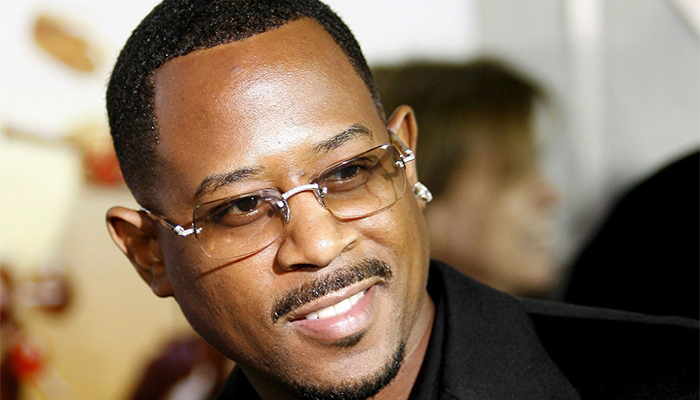 Martin Lawrence has been in quite a number of relationships and marriages over the years. Publicly, he began dating Lark Voorhies for a while before getting her engaged in 1993. They never got to wed legally. In 1995, however, Martin married his very first wife, Patricia Southall (Former Miss Virginia USA). The pair filed for a divorce in 1997; nevertheless, they have one child together who they named, Jasmine Page and she was born on the 15th of January, 1996. Lawrence then found comfort in the arms of his new girlfriend, Shamicka Gibbs, in 1997 and by July 10th of the same year, they got married at Martin’s Beverly Hills home. A total of 120 guests were present at the ceremony including celebrities such as Denzel Washington and Eddy Murphy. The couple, as well as their guests, were treated to good music by the incredible R&B singer, Shanice who sang the Minnie Ripperton classic “Lovin You.” Together, Martin and Shamicka are the biological parents of two girls; Amara Trinity who was born in 2002 and Iyanna Faith born in 2009. This is one union many thought would last, however, it wasn’t meant to be as Martin later also filed for a divorce from Gibbs in 2012 citing irreconcilable differences after over 14 years of marriage. After this second divorce, Martins sold out his mansion in the Beverly Hills. Around April 2015, the news of Martin Lawrence’s death flooded the news and social media platforms. It would be recalled that prior to the announcement of his death, Martin had been in the news for not so good reasons. In July 1995, Martin became so violent during the filming of “A Thin Line Between Love and Hate.” This outburst led him to be hospitalized at the Cedars-Sinai Medical Center. In 1996 he was hospitalized again after an incident when he became unusually aggressive at an intersection in L.A, erratically wielding a pistol at unarmed people as he screamed,”They are Trying To Kill Me!” The following year he was arrested for punching a man at a nightclub in Hollywood. Again in August 1999, Martin went into a 3 days coma caused as a result of exhaustion and dehydration he experienced while training for his upcoming movie, “Big Mommas House” in the plastic suit and heavy clothing. His body rose to a scary temperature of 107 °F (41.7 °C), thus he had to be hospitalized to receive proper medication. Nevertheless, the news of his death was quickly discovered to be one of those common celebrity death hoaxes that are becoming a trend especially with un-authoritative website and new agencies. We are however glad that Martin is alive and well and we hope to see him do more movies.